Depending on what you’re looking to achieve during your next remodeling project, you might be looking for some new cabinet hardware. Depending on what you’re looking to achieve during your next remodeling project, you might be looking for some new cabinet hardware. You can use lighter-colored cabinets in both your kitchen and your bathroom. It just comes down to the type of aesthetic you want to achieve. In any case, here are some tips for when you need to choose the right cabinet hardware for the lighter cabinets in your home. 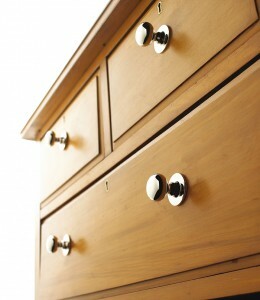 Knobs are the most conventional style of cabinet hardware. Use knobs on lower cabinets or other cabinets that you use the most often; the reason for this is that they’re unobtrusive but still easy enough to grip that you can open and close the cabinet door without too much much effort. Don’t forget to consider the type of finish you would like to use on your knobs, as well. Handles are the ideal choice for when you want to make your cabinets even easier to open, but still look great. You can use them in a kitchen, in a bathroom, or anywhere else in the home you might need a cabinet door or cabinet hardware. Choose the look, the size, and any decorative touches that can help make your handles stand out. Best of all, you have a choice when it’s time to install handles – they can either be installed vertically or horizontally, so select whichever feels more comfortable in your hand. After all, your comfort is our ultimate goal. Pulls are another possibility to consider, especially if you are aiming to make your room more functional. When you need more storage, a pull can make a storage bin easier to open and put back. Pulls are also great choices for kitchen appliances since pulling on the handle is easier to do than using a knob, which just isn’t practical for this situation. It’s easy to overlook the importance of hinges when it comes to cabinet hardware. But if the hinges you have don’t fit, then you will find that it will present plenty of headaches when your cabinets don’t open as smoothly as you want. Reaching for pots and pans to cook dinner or retrieving something from behind the mirror on the medicine cabinet both get easier with the right hinge. No matter what type of kitchen or bathroom cabinets and hardware designs you choose, WalterWorks Hardware has the expertise and supplies you need. We are well known through the Maryland, Washington, D.C., and northern Virginia area for our fantastic hardware and unbeatable knowledge. For more information, please give us a call at (410) 263-9711 or contact us online. For more tips on choosing hardware for your home, follow us on Facebook, Twitter, LinkedIn, Houzz, Google+, and Pinterest. This entry was posted on Tuesday, May 22nd, 2018 at 4:27 pm. Both comments and pings are currently closed.